Anxiety and mental health issues in children and teenagers is rapidly increasing. Services like CAMHS are overloaded and Childline recently reported a rise of 35% in calls regarding anxiety issues. Schools are quite rightly needing to focus on strategies to improve pupil’s well-being now more than ever. In recent years changes in the curriculum and testing for pupils, increased pressures from social media and the internet and other out of school pressures are all cited as having a negative effect on children and young people’s mental health and well-being, particularly that of girls. This problem is not something that schools are unaware of, the issue is how we can help our pupils cope with the world that they live in and deal with the pressures they face. 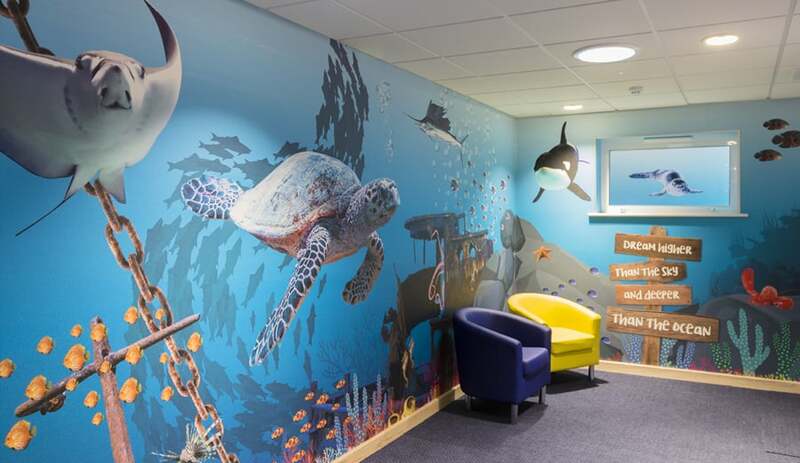 One strategy is to use specially designed wall art to create relaxation areas is one of many ways schools can support their pupils mental health and well-being. Whatever the name you choose for these zones or rooms, more and more schools are recognising the benefit of having designated areas where children can go to relax, calm down, and break out of the pressure that they are feeling. These areas are often havens for many children and are key to improving pupil’s well-being and mental health. 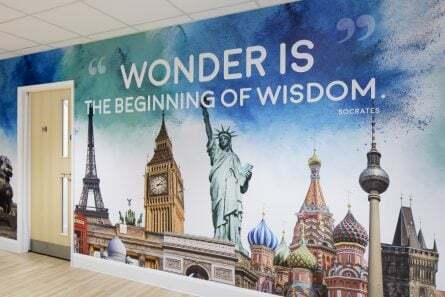 We have worked with a number of schools looking to develop their break out areas/rooms by using wall art to create calming colours and images or designs that make children feel safe and happy. There is also an increasing recognition of the fact that specific rooms for children to relax their minds is not the only way to support pupils well-being. 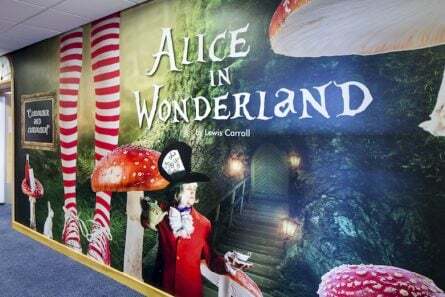 Themed corridors can provide safe places for pupils to transition through the school, multiple areas that children can escape their anxieties in, and areas to focus on being children which in turn can support their learning and development. Ensuring that the whole school environment promotes relaxation, play, socialisation, enjoyment and fun can help improve pupils’ overall state of mind by providing pupils with valuable ‘down time’ space and therefore promoting distinct learning times of the day and relaxation times of the day so that children get the breaks that they need. Being given permission to stop and allow their brains to process all the new information constantly thrown at them can really benefit children’s well-being and their ability to learn. Other popular initiatives that schools can then introduce within their newly calm and relaxing environment include meditation, yogo and philosophy for children. Here we explore the benefits of these strategies a little further. Recent news articles have cited a school in America who provide children with the opportunity to meditate instead of have punishments when they are angry or behave inappropriately in school. Allowing children time to escape their mind can alter their thinking, calm them down and enable them to realign the path of destruction that they are on that day. Teaching them this skill of dealing positively with negative thoughts and moments is also a life long strategy that can support their whole development. Schools that provide yoga as after school clubs and within the classroom have found that it can improve pupil’s well being as well as improve their fitness so is great for both their mental and physical health. Research has shown that pupils who participate in yoga within school can potentially be less likely to suffer with anger, control issues and fatigue. In addition, yoga can improve posture, positive attitudes and the pupil’s ability to relax. As with meditation many schools that use yoga in school believe it to be a crucial skill for life. Research by the Education Endowment Fund has shown that, not only can a regularly timetabled philosophy programme can increase pupils academic achievement but it can positively influence pupils patience, confidence and self-esteem which many feel has a strong benefit to their overall mental well-being or at the least the skills to deal with anxiety and mental health issues more easily. The Nuffeild Foundation have commissioned research into the non academic benefits of a philosophy programme as a result which is due to be completed in Jan 2017 and should provide more detailed information on the effects on Philosophy for Children for those who are interested in introducing this approach for supporting children’s mental well being. Wall art can provide the backdrop to a range of support activities to help ensure children remain happy, calm and balanced. Having an environment that is exciting to be in is of benefit to all in itself, whether there is a mental health issue, a well-being need or not, after all, we all want to be enthusiastic to be somewhere and if an environment is inviting the children will be more keen to be in school to learn and develop. 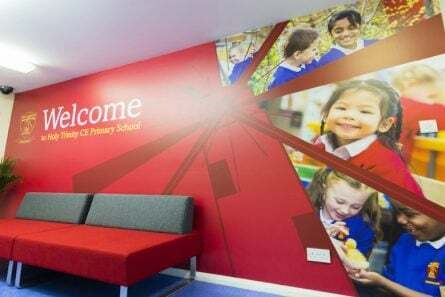 If you would like to find out more about how we can help you transform your school walls to support your focus on pupils well-being then contact Lisa Savage on 020 7404 3400.